Presented in a fun and creative way, team building exercises challenge the members of your group to step out of their comfort zones and work together. According to data collected by Queens University of Charlotte, roughly 75% of employers rate team work and collaboration as “very important,” yet 39% of employees believe that people in their own organization don’t collaborate enough. So it should come as no surprise that 86% of employees and executives point to lack of collaboration or ineffective communication as a primary cause for workplace failures. There is a difference between knowing the importance of teamwork and getting your group to work as a team. Sometimes this seemingly simple task can be more difficult than you’d imagine. We often receive calls here at Terrapin Adventures from companies looking to do a couple hours of team building. While we can help build morale with a short program, we are not going to really be able to address any significant issues or enact any lasting change to help improve team performance. A couple hours is simply not enough time to make a substantial difference. “In actuality, we would like to do multi-day programs or do a series of programs that follow up on earlier sessions either at our place or a company’s location,” explains Matt Baker, Terrapin Adventures owner. 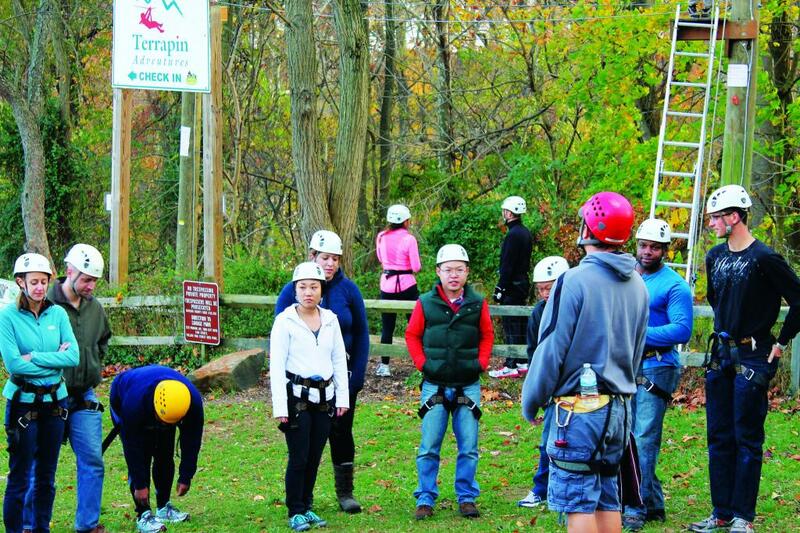 Conveniently located between Baltimore and Washington DC in beautiful Howard County, Maryland, Terrapin Adventures specializes in corporate team building – onsite or offsite, indoor or outdoor. Our group facilitators and guides will lead your team through a series of unique events and trust exercises that will help them think creatively and collaborate with one another. And all of our team building efforts conclude with a debriefing, where the group facilitators and guides relate the day’s team building activities into your group’s daily corporate workplace challenges. Team building takes time and effort. You won’t see long-lasting results over night, but if you stick with the program, you can help change your organization for the better. People, especially adults, are resistant to change, so it can take multiple team building sessions to really hammer the point home – teamwork matters! By working together with an experienced facilitator, we can start to see real results over time. This entry was posted on Thursday, October 22nd, 2015 at 10:58 am. Both comments and pings are currently closed.